This was the headline that the Texas Standard chose to run for this story. It’s soft-pedaling hogwash, that’s what that headline is. Forty-two Percent of Texans Are Poor is how that headline should read. That is what the coded word ‘struggle’ represents. Poverty. Though the state’s economy is experiencing relatively healthy growth overall, a new report by the United Ways of Texas shines a light on the surprising number of Texans who are struggling financially. The new report, “ALICE, A Study of Hardship in Texas,” says 42 percent of all households in Texas cannot afford basic needs such as housing, food, transportation and health care. ALICE, an acronym which stands for Asset Limited, Income Constrained, Employed, represents the growing number of individuals and families who are working, but are unable to afford the basic necessities of housing, food, child care, health care, and transportation. Asset Limited. Poor. Poverty. Now, the federal government and most especially the state of Texas will tut-tut that and say that those people are well above the poverty line established by government. Again I say, hogwash. Federal guidelines and especially guidelines from the state of Texas will not be truthful, if by truthful you mean accurate. This goes for anything that touches on the sacred beliefs of the average American, most especially the delusion that poor Americans aren’t poor. They just aren’t wealthy yet, and they never will be wealthy. But don’t tell them that. This is well trodden ground for me these days because I’ve spent the better part of two months arguing with an in-law about this very subject recently. I don’t think you know what poverty is. I was born in it and raised in it. The only thing that got me out of it was hard work. I had no intention of raising my children the way I was raised, therefore they had better than I had. And I do pretty well now only because I work hard to better myself. President Trump is making it so people can work and better themselves and get off the coattails of the government. I do not understand how anybody could think putting people back to work is a bad thing. Obama on the other hand closed down factories and put millions of people out of work and on food stamps. I had to block that poor fool because he kept calling me stupid. This exercise would be me once again wasting my time, convinced I can somehow reason with someone who refuses to think. The uninformed political opinions he’s throwing around I will dig into somewhere else, have already dug into somewhere else before (Obama, Caveat Emptor) But the poverty stuff? I don’t talk about that very often (Greece, Bootstraps) However, I’m pretty sure I have a general understanding of what poverty is and what it can do to people. I’m positive I understand it better than that in-law, because poverty has been my constant companion throughout my adult life. That in-law is better off than me, but he’s still right on the margins of poverty. He’s middle class but not comfortably so, and not likely to stay part of the middle class unless he can keep working for another twenty years. The proof is in the statistics cited above, 42% of Texans are poor. That is just under half of all Texans being poor. Half. No one who isn’t independently wealthy will stay middle class without working, and independent wealth is built up through generations of hard work. Something I know neither he nor I come from. There was a brief period of about two years in my adult life where I wasn’t poor. And when I wasn’t poor I never struggled for anything other than struggling to keep my job so I could keep paying for things. People of means do not struggle. They see a shrink and work it out, because they can afford to pay to have someone listen to them and help them work out their problems. Having a job that generates enough money to live on is not struggling in the way that the research demonstrates. The struggling that the United Ways is highlighting comes from having too much work and not enough money. A uniquely post modern development. Gainfully employed and still starving. I keep linking this video in the vain hope that people who think that a dollar has work value attached to it would watch and learn a few things. It’s not like it’s a long video. It’s not a huge investment in time to watch. I’m sure it’s quite painful to watch if you are a conservative. Conservatives and conservative economics have created this problem. Have created it more than once. Thinking you have to work to survive, to deserve to survive, is outmoded thinking and has caused the kind of crisis we are living through today. Has caused it repeatedly down through time. Today’s system throws off enough wealth all on it’s own to eliminate poverty completely if we simply set ourselves to the task of eliminating it. And even if we do eliminate poverty we’ll still have people wanting to work, and even more people capable of doing that work, because poverty is a man-made ill. Poverty is something we created to justify ourselves and our assumed status in life. Poverty is looked down upon as being caused by the behavior of the poor themselves. This is patently not the case, as the OTM series Busted: America’s Poverty Myths (Bootstraps, again) goes to great lengths to spell out. But that doesn’t change the beliefs of most Americans. Poor people are more hated now than they have been in generations, and this is a worldwide phenomenon, not just in America. If you think of yourself as white and you are poor in modern America, the fact that you are poor grates on you so much that you go looking for people who suffer more than you. Having a paler skin color is seen as a sign of status, has been seen as a sign of status down through the ages. Being pale means that you don’t have to work out in the sun. You have leisure time. you can throw this assumed status around, use it to your advantage in social interactions. Unless you are poor. If you are poor, there is no question that your paler skin doesn’t convey advantage any longer, because there are demonstrably people darker skinned than you that have more status than you. They have more status because they have the conveyor of modern status, money. This is a corruption of the natural order in the mind’s eye of a racist. And we can’t just allow the natural order to be corrupted now, can we? This is how we get to the point where the party of Lincoln, the party of the man who lead the Union through the Civil War and destroyed the slavery based economy of the Southern Confederacy; this is how the Republican party has become the party of people who wave the stars and bars of the confederacy and demand that they be given privilege over the brown-skinned. Republicans see everyone who is darker than they are as other, outsider, illegal. They couch their arguments in law and order, just like Nixon coded it in the seventies. But Nixon was a racist, too. They don’t even know that what they are promoting is racism. The Orange Hate-Monkey’s naked attempt to create a white American royalty. How can Democrats win in deep red America? During the midterms, momentum behind progressive candidates in red states garnered national attention — Beto O’Rourke in Texas, Andrew Gillum in Florida and Stacey Abrams in Georgia. These were no overnight successes. They were the culmination of, among many things, including the tireless efforts of grassroots organizers. We are going to have to go out and prosthelytize to the poor, rural, white voter. We are going to have to go out and explain to them the harsh nature of the reality we are faced with. Because we cannot go where they want to go. We have to explain to them that we are losing access to good drinking water. That even the air we breath is under constant threat. Will lax regulation on businesses turn every Texas town into another West, Texas? Or will we go the way of Oklahoma and let hydraulic fracking activate long dormant tectonic faults, triggering earthquakes? But it is even more basic than that. Will our children and their children go hungry? Will they have access to shelter from the cold or the heat, especially given the unpredictable nature of the climate change we are creating? Will there be schools to teach the children that all of us will rely on in the future to provide every single thing we need? Things we will need paid for with money we didn’t work for that day? 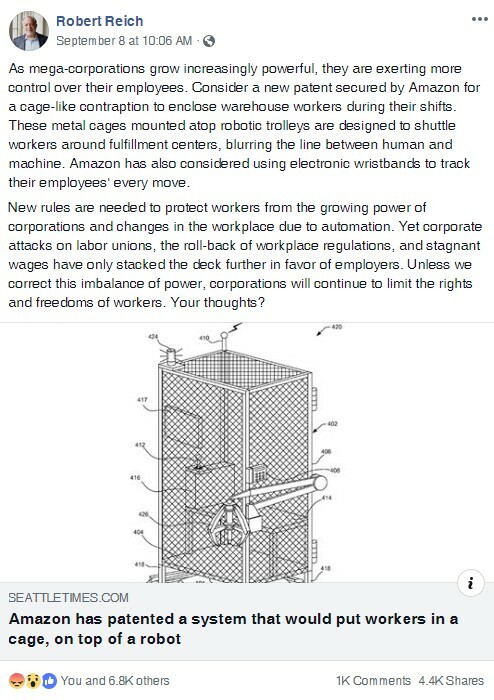 We didn’t have to work for, because the system itself provides a mechanism (money) that allows us to not have to work every single day in order to survive? These are real, hard questions that have to be answered today, so that we can have access to those things tomorrow. All of us, not just the 1% that currently receive all the benefits of modern society. Or would you rather that your children starve for want of food when fortunes turn on them as it does on everyone? Sleep out in the cold because they can’t afford shelter? Rather that they die of preventable diseases because there was no profit in researching cures or vaccines? All of these things require public investment, something that you won’t learn from the worship of robber barons that pervades what passes for conservative ideology these days. Conservatism is about adhering to the past, not looking beyond what our ancestors did, the rights they claimed for themselves. That is the sum total of conservatism. Liberalism is about experimentation. Liberalism is a friend to entrepreneurs, scientists, etc. Liberalism promotes new ways of thinking and new ways of dealing with the world. That is the definition of liberalism. Look it up anywhere aside from conservapedia, and you will find that I am right on this subject. Liberals accept that society and its inventions, things that we all inherited, belong to all of us. Because none of the living invented any of the technologies that provide the food for our tables today. We stood on the shoulders of giants and thought ourselves tall. Liberals understand that the only way to do justice to those who came before us is to see that those that come after us have what they need to thrive, just as we had what we needed to thrive. Our rights include things like clean air and clean water. Health care is a basic human right since it takes the wealth of the entire nation to maintain the system, it has to be available to everyone, not just those who can pay. If you want questions answered, you have to ask questions. Ask questions which are answerable. Declaring that everything you don’t understand is a plot to take the little you have to your name now is nothing more than a paranoid delusion. You can’t lose something you don’t own, and most of what we deal with today are things that don’t belong to us alone. The internet is useless without other people to talk to. You can’t tend to your own physical injuries if those injuries require expertise to remedy. If you have that expertise and try to doctor yourself, then you have a fool for a patient. It takes others to do anything meaningful in life. Spitting on the state, on government, and turning your back on progress in the name of preserving what you have now is to settle for less than you could have had, if you only have the sense to look around you with eyes that aren’t clouded by fear. Modern farming would be impossible without federal research grants, federal subsidies, federal mandates. The ability to get a mortgage and own your own home was a federal mandate. Every single scientific endeavor survives on federal seed money. There would be no internet without it. There would be no handheld computer to read this message on without NASA. There would be no vaccination program without federal mandates. No science-based medicine without government oversight and consequently no way to know what medicines work without government involvement. So yes, I will rely on government. So will you, even if you don’t think that’s what you are doing. Government touches everything. And in the United States, we are the government. We can pay ourselves enough that none of us need starve, and still leave room for entrepreneurs to profit off of their ideas, giving them motivation to create, to work. Contemplate that for as long as it takes to sink in. Wrong Again. Why am I Not Surprised? Donald Trump is leading all other Republican candidates — not just in polls but also, according to Google Trends, in Google searches. This could push Trump even higher in Google’s search rankings, and such higher rankings would in turn bring him even more support. Donald Trump is and will always be a three time loser. In order to be this at running for President, he will have to run one more time after he loses this bid. I encourage him to stick with it. I would like to be right in a prediction for once. 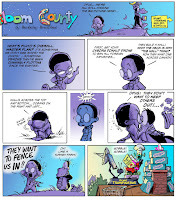 In the meantime Bill and Opus for President 2016. Sadly, Bill and Opus did not win, although the brain that briefly inhabited Bill the Cat’s body did apparently get enough electoral votes to become president. The conspiracy that aliens are controlling the OHM remotely remains a distinct possibility, however, since the brain of Donald Trump has never been found after it left Bill’s head. 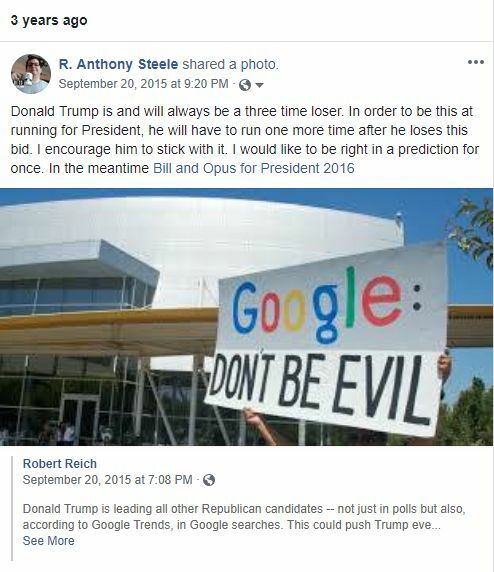 Looking back at my utter cluelessness as to just how ready nearly half the US voting population was, willing to watch the entire place burn rather than vote for Hillary Clinton, makes me wonder just how much of that ire is Facebook and Google’s fault? How much of my cluelessness is the fault of their algorithms and how much is my own desire to see the United States continue in some recognizable form? No matter what the answer is, the America that emerges from under the OHM’s attempted dictatorship will be a different America than went into it. That much is certain. It is certain because America has already changed under the OHM’s naked propagandizing, suppression of the government’s regulatory ability, disregard for disaster relief, etcetera, etcetera, ad nauseum. Whether that change is for the better or the worse will be determined this November. I’ll see you all at the polls. 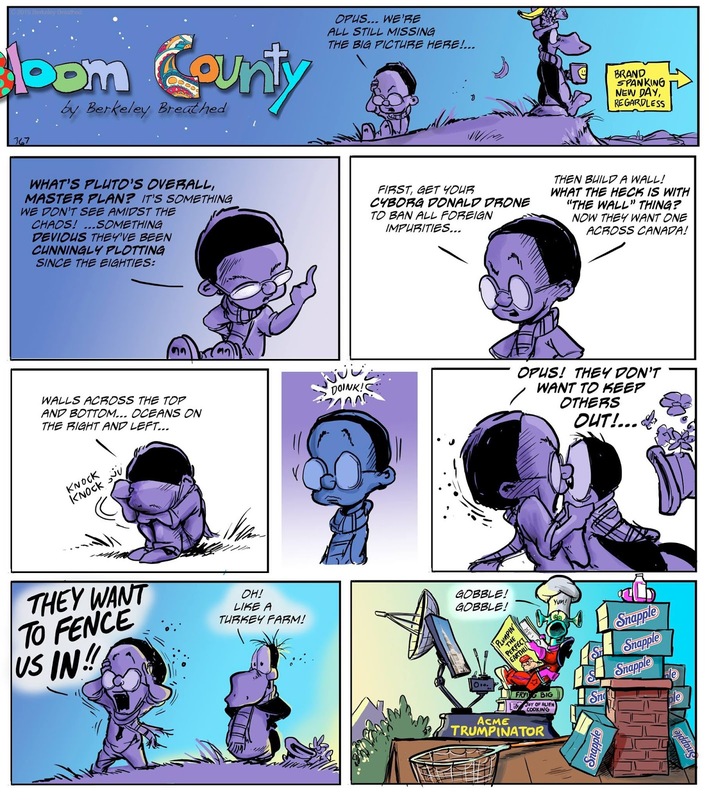 Author ranthonysteelePosted on September 21, 2018 Categories OHM, Podcast, PoliticsTags Bloom County, Elections, Facebook, Google, NPR, Robert ReichLeave a comment on Wrong Again. Why am I Not Surprised? So we’ve discovered the genesis of IOI then? What’s IOI? Innovative Online Industries. You know, the corporation from Ready Player One. If you haven’t read it, get the Audible version read by Wil Wheaton. It’s excellent. Don’t watch the movie of the same name; or more exactly, don’t watch the movie of the same name and expect to see the story from the book. The movie contains an entirely different narrative, with different characters and different FX sequences. The plot for the book would have been far less exciting on screen, and would have made for a much longer film. As far as video stimulation goes, the movie has excellent FX sequences, they just aren’t plot points that occur in the book. At all. How do I know that Amazon is the corporation from Ready Player One? 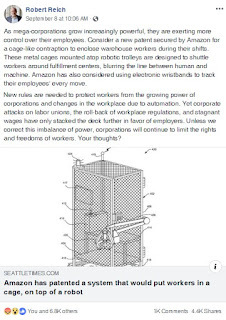 Well, for one thing, that cage looks like something that IOI would think was OK for workers to spend the majority of their lives in. For another, the links to the book and the movie both go to Amazon. I could point other places, but they’ll all be owned by Amazon eventually. The Wife and I watched the film a few weeks back. I had never read the book at the time, she had read the book. We set the viewing up on purpose as a test to see who enjoyed the film more. I’m pretty sure I won that contest. I had nothing to compare the film to and so had no expectations for it to fulfill. She spent the first thirty minutes of the film just trying to figure out where in the book the scriptwriter started the narrative at, because it certainly wasn’t anywhere in the first half of the book in spite of the fact that the first scenes have him living in the stacks. Having watched the movie I then fell asleep to Wil Wheaton’s voice in my ear for the next week or so, describing the world of Ready Player One. A world that is either a post-apocalyptic hellscape or a capitalist paradise depending on your point of view going into the book. In any case, as usual, the Hollywood version has cardboard cutouts for villains and the novel has pretty well-fleshed characters that you can believe exist somewhere. Neither tale is free of flaws, but both have their own moments of entertainment value. Just understand that, when I envision the giant robot battle for capitalist dominance of the globe, I will now picture Jeff Bezos inside the Mechagodzilla. Based on a Facebook status from last week. His ability to communicate ideas like this succinctly is one of the major reasons that I wrote Obama Best President Since Eisenhower in 2015. It was a tongue in cheek nod to the fact that Americans were treating Barack Obama as if he was just the latest in a very long string of bad presidents, and not really, objectively, the most dedicated man to hold that office in their lifetimes. This has been documented since he left office. The fact that most people remain ignorant of the state of the union, or the quality of Barack Obama’s words and actions, is the reason why we find ourselves where we are today. Wise up, America. Facebook status mirrored to the blog. Stupidity is Not Funny or, Laughter is a Suicide Pact? 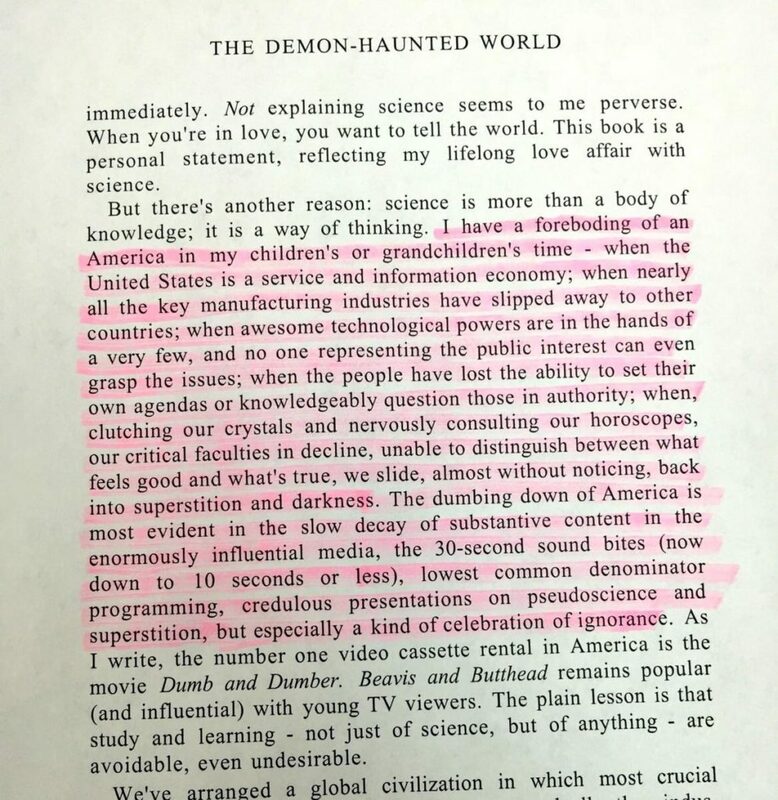 I’m listening to Carl Sagan’s The Demon Haunted World on Audible right now. I remembered reading this commentary on the celebration of stupidity somewhere online before deciding I needed to at least read the book once. The Facebook memories for today included a paragraph or two on the subject. Ah, memory hole plugged. I knew I’d read that somewhere before. It is a point of pride to me that I couldn’t sit through Dumb and Dumber. I never bothered to watch Beavis and Butthead; as in, ever watch. I know one joke from that series. I remember it only because I am unable to forget it. A family member loved the show back in the day, and he and another friend enjoyed pretending they were Beavis and Butthead and would do that skit repeatedly until I gave up and laughed. Gave up and laughed, against my better judgement. Stupidity is not funny. Stupidity is dangerous. Ignorance gets people killed. All. The. Time. Not knowing that your pool is the most dangerous place in your yard is what kills children every year. I stood outside on the deck in my backyard waiting for my now-crawling son to fall in the pool, and after he did fall in the pool I jumped in fully clothed to pull him back out. This was the third person I had saved from drowning in my life, the only time I knew that what was about to happen would happen. I knew that the baby would explore his world. I knew he would not know what to think of this thing called water and edge and pool. I knew he would probably fall in, and I watched to see if he did. When he did I was prepared to pull him out immediately, and the scare kept him from ever going near the pool again unless we were present and teaching him to swim. He swam like a fish at two or three, I don’t remember when exactly he took to water, but he was probably swimming better than he could walk for most of his childhood. Knowing he would fall in allowed me to save his life and turn the unknown danger into a teaching moment that he carries with him to this day. Knowledge is power. I don’t find stupid people amusing, I find stupid people threatening, and for very good reasons. Stupid drivers get other people killed. I see it pretty much every time I drive. Stupid people on their way to painful, deadly futures in their cars, and they’ll probably take someone else with them when they do that one stupid thing that gets them killed. Stupid voters elect poor leaders. It is not for nothing that MAGA=Misguided Appallingly Gullible Americans, this assertion is demonstrable, repeatedly. Stupid voters elected the Orange Hate-Monkey. The OHM himself acknowledges this with his damning with faint praise comment “I love the poorly educated.” Stupid leaders destroy entire nations. The OHM and his willful ignorance, his flock of the willfully ignorant in tow, are burning this country to the ground as I type this out right now. The idiots will not know they’ve destroyed the country until it is too late to save it from them, but they might as well be covering everything in gasoline and lighting the match themselves. Destruction is just about that certain. I will not laugh at the OHM or his followers. They aren’t funny. They are threatening my life and the lives of my children, and I won’t allow those threats to go unanswered. There will be consequences for the two years of the OHM’s rule, one way or another. The stupid who voted for him need to feel this pain themselves, like discovering you are immersed in a liquid that you didn’t know was there, and no one told you how to swim before you fell in. They need to recognize danger and avoid it in the future. How will this lesson be taught? That is a very good question. A link to the radically expanded Facebook status. Laughter is a Suicide Pact is a paraphrasing Niven’s puppeteer Nessus from Ringworld. 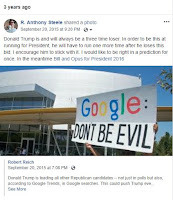 Author ranthonysteelePosted on August 10, 2018 March 26, 2019 Categories Economics, OHM, PoliticsTags Carl Sagan, Facebook, Robert Reich, SGU, StupidLeave a comment on Stupidity is Not Funny or, Laughter is a Suicide Pact? Trump’s so-called “Presidential Advisory Commission on Voter Integrity” convenes for the second time today, in New Hampshire. It will be chaired Kris Kobach, Vice chair of the Commission (the chair is Vice President Mike Pence). Kobach trying to make the case that voter fraud was rife in New Hampshire in the 2016 presidential election – using data showing that 6,540 people registered to vote there using out-of-state driver’s licenses. Kobach suggested last week, in a column he wrote for Breitbart, that these voters never lived in New Hampshire at all. It was voter suppression 100 years ago and more, and it is still voter suppression now. The solution to the problem that they don’t’ have and won’t undertake is to make voting mandatory and thereby make any and all documents affirming your citizenship legitimate proof of voter eligibility. These kinds of people would much rather put barriers up that only allow conservatives to vote, this is the personal track record for each and every member of the commision that is visible to anyone who cares to look. Kris Kobach, vice chairman of the Presidential Commission on Election Integrity, claims to have “proof” of voter fraud in New Hampshire that’s widespread enough to have swung a U.S. Senate election in favor of the Democrats. He doesn’t. Kobach’s proof? He says several thousand people who registered to vote on Election Day with an out-of-state driver’s license have not since registered a car or gotten a driver’s license in New Hampshire. The cashiering of the entire panel shortly after I wrote the above paragraph rendered the entirety of what I was going to say on the subject largely moot. Debt Ceiling. Pageantry for the Legislature. This video is right in line with my current thinking on the subject. Percentage of GDP is a more important measure of government spending, and by that measure we spend way too much. The ceiling is a meaningless argument that sounds good on TV. Presidential pageantry, but for the legislature. Stop flouncing around and start doing some real work. Author ranthonysteelePosted on September 6, 2017 Categories Economics, PoliticsTags Facebook, Robert ReichLeave a comment on Debt Ceiling. Pageantry for the Legislature. Republicans are eyeing deep cuts to disaster relief to pay for Trump’s wall. 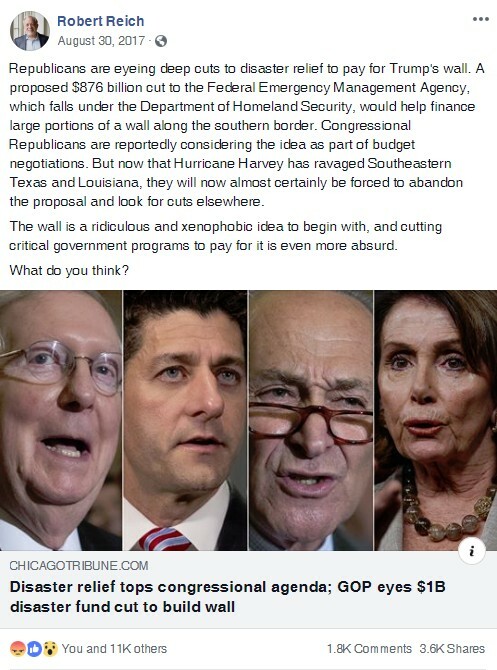 A proposed $876 billion cut to the Federal Emergency Management Agency, which falls under the Department of Homeland Security, would help finance large portions of a wall along the southern border. Congressional Republicans are reportedly considering the idea as part of budget negotiations. But now that Hurricane Harvey has ravaged Southeastern Texas and Louisiana, they will now almost certainly be forced to abandon the proposal and look for cuts elsewhere. The wall is a ridiculous and xenophobic idea to begin with, and cutting critical government programs to pay for it is even more absurd. You know what? This figures. Completely. This is exactly what Trump and his GOP congressional leadership flunkies would set their sights on. I mean, he comes out claiming something like “This will be the greatest disaster response ever! People will point to this as the way it should be done!” and then the next day you discover NOPE, he’s going to gut FEMA. Perfect. This makes perfect sense. 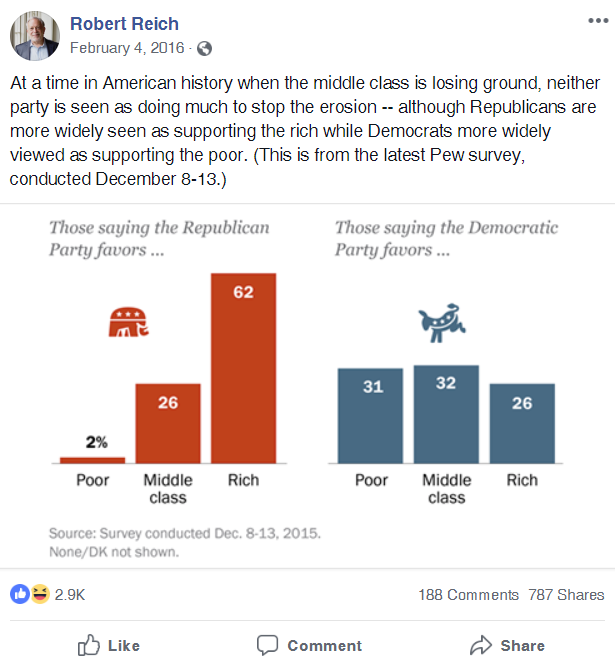 From Robert Reich’s Facebook wall comes this. Today, nearly seven months after the election. 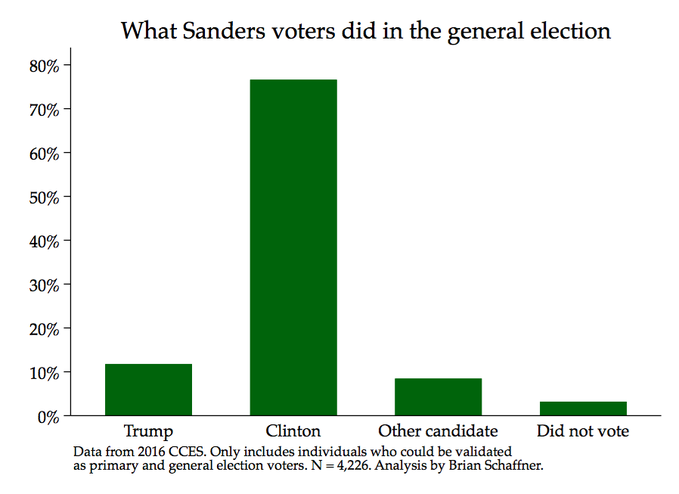 About 12 percent of Bernie Sanders’s supporters in the Democratic primary crossed party lines and voted for Donald Trump in the general election, according to a new analysis. In several key states — Pennsylvania, Wisconsin, and Michigan — the number of Sanders to Trump defectors were greater than Trump’s margin of victory, according to new numbers released Wednesday by UMass professor Brian Schaffner. I get really, really tired of the armchair quarterbacking of political events. That’s what I think. I think the three critical states of Pennsylvania, Wisconsin, and Michigan were so close as to make the term “victory” an almost meaningless label to apply to either candidate, which is why I ignore most pundits when they talk about why the race turned out the way it did. None of them could do better than Nate Silver and fivethirtyeight.com did before the election and even the best science around still gave Hillary a better than 70% chance of winning. I’ve known virtually since the second or third week after the election that there was only one person to blame for swinging the election to Trump in the final weeks running up to election day. The impact of Comey’s letter is comparatively easy to quantify, by contrast. At a maximum, it might have shifted the race by 3 or 4 percentage points toward Donald Trump, swinging Michigan, Pennsylvania, Wisconsin and Florida to him, perhaps along with North Carolina and Arizona. At a minimum, its impact might have been only a percentage point or so. Still, because Clinton lost Michigan, Pennsylvania and Wisconsin by less than 1 point, the letter was probably enough to change the outcome of the Electoral College. Could Clinton have done a better job? Without question. Clinton herself is another subject I hope to tackle at some point (here) but she did no better and no worse than any of the male presidential candidates before her as far as her activity and campaign go. So let’s not play these games that the DNC wants us to play right now. They want us to keep Bernie Sanders from changing the Democratic party. They want us to embrace the neoliberalism introduced by Bill Clinton. That is a part of history now. What the future holds is anybody’s guess but you don’t earn the label progressive or liberal by looking to that past. That is Conservatism and playing the Republican’s game. That is playing to lose. Let’s play a progressive game next time and see if the GOP can keep up. Let’s play to win for a change. There are now 2 Donald Trumps – Teleprompter Trump and Tantrum Trump. Teleprompter Trump, who almost sounds presidential, isn’t the real Donald. He’s the person reading from a teleprompter words written for him by aides and Cabinet appointees. We saw Teleprompter Trump Monday night talking about Afghanistan and yesterday talking about veterans. Tantrum Trump is is the real Donald. It’s Trump minus the teleprompter. We saw Tantrum Trump at his rally in Phoenix Tuesday night when he called the press “sick,” threatened to close the government if Congress didn’t give him money for his wall, attacked Republican senators, and hinted he’d pardon racist Sheriff Joe. And in this morning’s tweets where he went ballistic on Paul Ryan and Mitch McConnell. And last week when he called white supremacists “good people” and criticized “both sides” in Charlottesville. Tantrum Trump is unhinged and dangerous. Republican members of Congress with any integrity must stop him. There was a broad group of people who watched Ronald Reagan through his last years as president and marveled at the difference between Reagan on script and Reagan off-script. Reagan off-script was frequently befuddled towards the end of his second term, prone to mis-speaking or outright making stuff up. Maybe it was the Alzheimer’s we now know he had, but as I watch the downward spiral of this president I can’t help but think back to those years and wonder if we weren’t seeing more of the real Ronald Reagan when he wasn’t trying to be presidential. 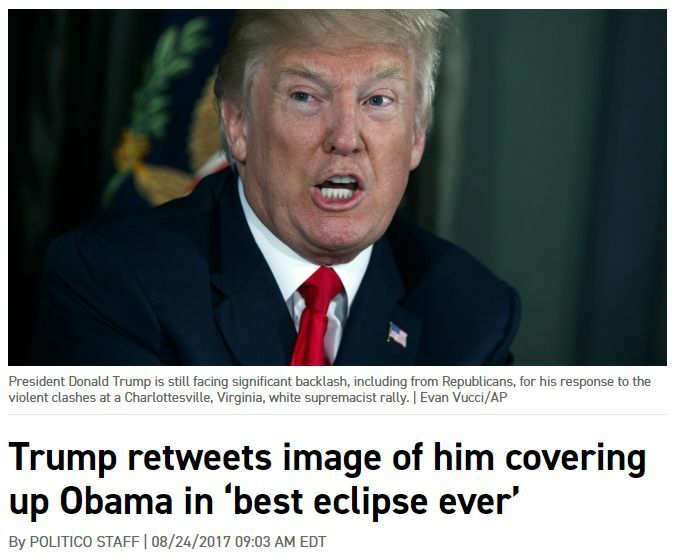 What does that say about the Orange Hate-Monkey? Is he the real Donald Trump? 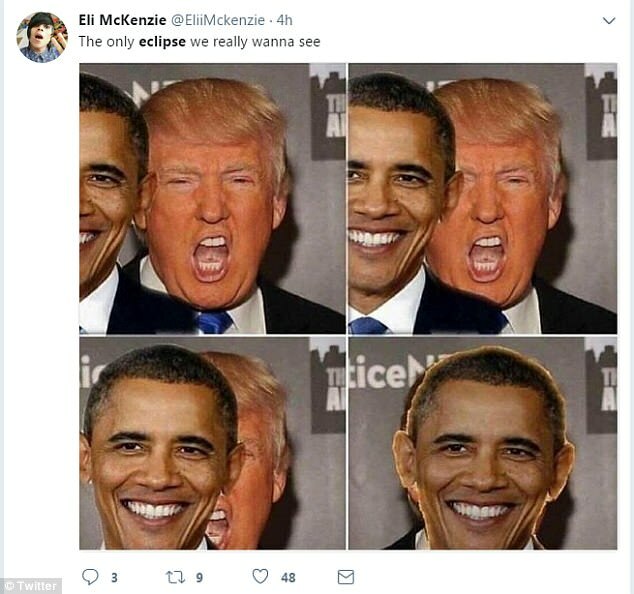 For What It’s Worth, the original eclipse clip was Trump being eclipsed by Obama, because the day goes from light to dark with a halo of orange around the darkness (rimshot) get the joke? OK, don’t laugh. Anyway, of course he gets someone to make the opposing MMGIF and retweets it. The guy has tissue-paper for skin. Facebook status backdated to the blog. Trump did eventually pardon Joe Arpaio.